Father’s Day is different for every dad and child out there. Tomorrow it will be celebrated in many ways and I am no different. I’ve always thought that gifts and cards were unnecessary. I guess that comes from my dad. For him, Father’s Day was golf day. You couldn’t find my dad the mornings of Father’s Day because he was out yucking it up on the golf course at an early hour. It was his way to spend the day. My mother always told me that my father didn’t need a BBQ, a tie , or a card, but just time to enjoy simple pleasures that his own father never got to take part in. As one of 8 children of immigrants, my father didn’t have a tight relationship with his father. as my grandfather was always working and didn’t play favorites with his children (as my dad told me). It wasn’t til I was old enough to caddie for my dad that he let me join him for Father’s Day. My dad wasn’t cold, but from the first moments he stepped on the course, I knew why he always did this in solitude. This was his way to be by himself. He loved his family, but Father’s Day was his day of peace. Peace withhimself and withhis thoughts. He’d hit a bad shot and chuckle to himself. He’d hit a good putt and laugh nervously as if to say he was just lucky. His golf game was like the way he lived. Quietly straight down the middle with not much power or pizzazz, but lots of finesse and with a great positive perspective. The smile my dad had while he played golf was infectious. My most memorable Father’s Day might have been 1987 when I was visiting home from NYC and my dad asked me if I wanted to join him. To be invited to be with him on his Father’s Day round at Harding Park Golf Course was great. I had arrived to the point where he wanted to let me be a bigger part of his day. I wished him luck for a Happy Father’s Day and he looked at me and waived it off then hit his shot. In our lifetime I don’t think I ever got to the point where my golf game got better than my dads and I could beat him. I could hit it further than him, but that was it. He was only 5’6″ and 130 lbs. I was bigger than him yet he stilled played a game and lived a life that was hard to mirror. It was a foggy morning and it was so peaceful. We didn’t talk much but it was still noisy. Across Lake Merced you could hear the US Open at the Olympic Club being played. Crowds would cheer and groan with the shots across the way. The beauty of the US Open golf tournament is that it is always played on Father’s Day weekend. 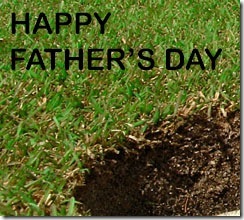 And every year it reminds me of that 1987 golf game with my dad. As we neared the end of the round on the par 3 17th hole I thought I was going to beat my dad for the first time. I hit my ball on the green. It was a lucky shot. The crowd over at the US Open almost cheered at the same time as my shot landed and I recall him telling me that the crowds were rooting for me as he made his practice swings. Then he took his 3-iron and hit a shot I lost in the fog. I don’t know how I lost it in the air. I looked at him and told him I thought it went into the bushes. As I got near the bushes he just sat in the cart and whistled at me to look in the cup. I glanced and he laughed. A hole-in-one on Father’s Day? Are you kidding? He popped a cigar into his mouth and watched me finish the hole and chuckled. He didn’t say anything more, but just put out his hand for me to give him back his golf ball. He just hit a hole in one with the greatest golfers in the world about 300 yards away on Father’s Day and I was happier than he was. He was at such peace with himself after the round was over. He drank a beer, watched the tournament on the clubhouse TV and didn’t even celebrate. That day I think I understood what Father’s Day really meant for him. It was his Father’s Day for his father and not for him. All the dinners, BBQs, cards and ties were appreciated but never necessary. Tomorrow will be the same for me. I know my wife has gone out and gotten something. But she knows tomorrow for me is not for me. He’s been gone for 3 years now but I will go back 22 years to that morning with my dad, a memorable one probably more for me than it ever was for my dad. 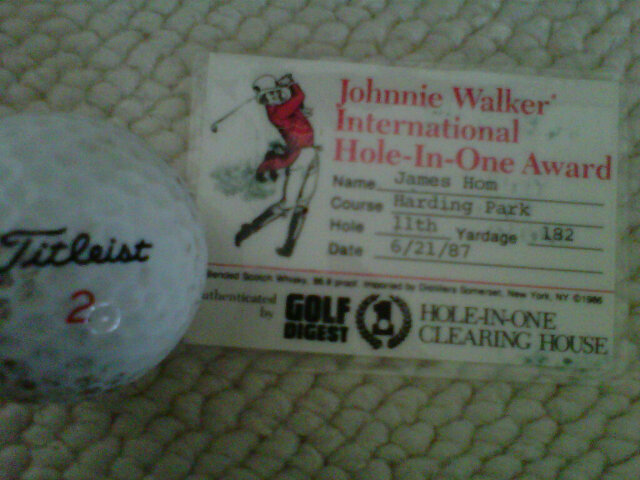 His hole-in-one ball still sits above my desk and remains one of my favorite pieces of memorabilia. When he passed and I took over his desk, I found all of those old ties and cards. The material things were not what he needed. I know my children will want to think of me on Father’s Day, but I hope they will remember their grandfathers as well. They are the men and the generation that the day was intended for, not me.